Data visualization should be iterative. You should get a good initial draft put together and then check to make sure it meets your success criteria. Then check the design to ensure it it effectively conveys information in a manner that is easy for your audience to consume. You can then make some changes and check things again. One design check you’ll want to perform is the Squint Test. Lean/step back from your screen and partially close your eyes. Use an application that blurs the details of a web page containing your report or an image of your report, creating an effect similar to squinting. This allows your design to become blurry, removing visual detail so only the largest, most rudimentary shapes are seen. When you squint at your report/dashboard, you’ll notice the overall layout and the elements that stand out most. In other words, the Squint Test gives you a high-level view of the visual hierarchy of your work. This is a great way to check that you are making good use of preattentive attributes and Gestalt principles! Are any foreground elements not standing out enough against their background? Are there any background or border elements that unintentionally draw more attention than more important data elements? Is the most eye-catching element on your report page an important element? Are your charts in an appropriate order on the report page? Are elements spaced appropriately so that objects that are closer to each other have some type of relationship? Is the report page balanced so one side is not heavier than another? Is the amount of white space on each side of the report fairly even? Are there colors that “pop” more than other colors? Are the items that pop intentionally highlighted or accidentally overly prominent? I usually turn the blur to about 6 to perform my Squint Test. As an example, below is a draft of a report page I made earlier this year. The first image is the original report, and the second image is the blurred version to be used for my test. I don’t use a lot of chart backgrounds, and my report page background is a very light gray. So they aren’t overshadowing any objects in the foreground. I also don’t use chart borders, so things look good there. The items that stand out the most are the image in the top left with the glucometer and tomatoes, the matrix with conditional formatting that shades the cells blue, and the box and whisker plot in the lower left quadrant. I’m ok with these items being the most prominent. Although the image could be considered decorative, the image is helpful in explaining the information contained in the report (glucose readings).This is more meaningful when viewing the full report with multiple report pages. The other two prominent elements are displays of data. The matrix is most prominent where readings are high and needing attention. The box and whisker plot is a good summary of glucose levels throughout the day. Charts seem to be in a logical order. Flowing left to right, I get some quick summary numbers and trends, individuals readings that explain those trends, the readings shown based upon time of day, the range of readings throughout the day, and then a longer term view of readings throughout the day over time. When I look at spacing, I think the matrix needs to be moved to the right to make the space between it and neighboring graphs more even. The matrix is not more related to the sparklines and KPIs to the left than it is to the line chart to the right. One could argue that the page is a bit unbalanced, since the scatter plot and the line chart are a bit less prominent than the other graphs on the left side of the page. I think moving the matrix to the right a bit plus the use of the dark purple colors, evens it out somewhat. After reviewing my findings, I could make the necessary changes and then check it again, iterating until I am satisfied. 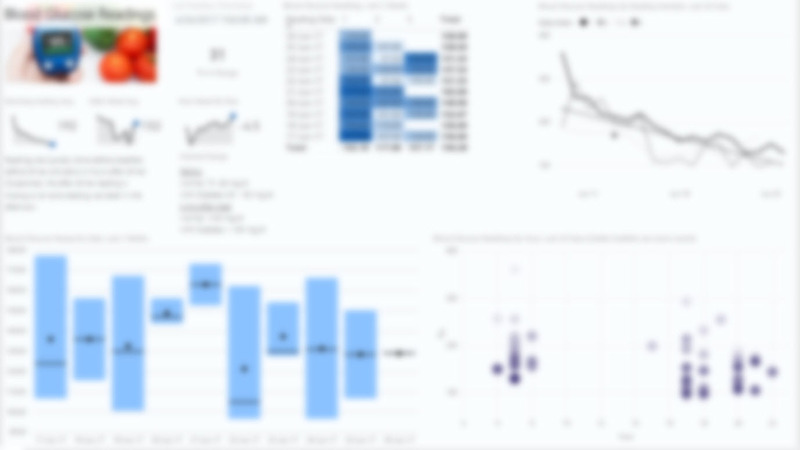 Now you can use the Squint Test to check your visual hierarchy of information and improve the efficacy of your Power BI reports. Happy squinting! The Gestalt principles of visual perception describe how humans tend to organize visual elements into groups or unified wholes to help us make sense of visual stimuli. Basically, we perceive the visual world as complete objects rather than a bunch of independent elements. For instance, you probably see a triangle in the white space in the first image below. And in the second image, you probably see a rectangle. Your brain is simplifying visual elements into what it commonly finds them to be (the triangle and rectangle). Similarity: We perceive visually similar (by color, shape, etc.) as being in the same group. Closure: We perceive objects as being whole even when they are not complete (such as the rectangle above). Symmetry: We tend to perceive objects as being symmetrical and pivoting around a center point. Continuity: We perceive objects that are aligned with each other as being in a single group or object, creating a single path or shape rather than multiple distinct paths or shapes. Good Gestalt/Prägnanz: We like to find simple patterns. We perceive objects as related if they form a pattern that is regular, simple, and orderly. Past Experience: We categorize visual stimuli based upon our past experience. If objects are usually perceived close together in time or space, we tend to see them as being related. This is how we recognize letters and words. Here’s a 20-second video I found that illustrates many of these principles. None of the Gestalt principles work in isolation – you’ll usually find multiple principles at work simultaneously. In the top chart, bars are ordered alphabetically by product name. In the middle chart, we changed the bar order to be descending by sales amount. This satisfies our need for the trend to make a smooth descending path as seen in the Gestalt Principle of Continuity. In the third chart, we have changed the color of the bars to all be the same. The color of the bars didn’t have any special meaning, and the entire chart used the same categorical axis and measure. This follows the Gestalt Principle of Similarity. Instead of seeing individual bars, we now see them more as a group of bars. In the top chart, try comparing sales for each product within a quarter. Which product had the highest sales in Q3? This should be fairly easy. Now try using the top chart to compare the sales for Product B over time. It’s a bit more difficult because you have to pick out the blue bar in each cluster. Now try using the bottom graph to examine sales for Product B over time. It should be much easier because the bars for each quarter are close together. You can see these charts on PowerBI.com here. Check your placement of charts on the report page. Are charts that are closer to one another actually more related than other charts that are not as close together? Are you leaving enough white space between visuals so that we can tell where one visual ends and the next begins? Be sure to group things appropriately for the most common analysis to be performed, such as with the clustered bar chart example above. Proximity of objects within a graph is important. In simple bar charts with one category and one measure, use only one color on the bars, unless you are purposefully trying to highlight a trend, grouping, or data point. Order bars/columns by descending or ascending value when not trying to show trend over time. Use low saturation or neutral hue colors as backgrounds in charts so data points stand out more than the background. Be careful with network graphs. In these graphs, proximity does not necessarily indicate similarity, and spatial position does not always have a meaning. It’s just an algorithm determining where to place objects within the chart. Check for any false conclusions that may be drawn by these properties and change your chart or add explanatory text to help users understand what information you are trying to convey.